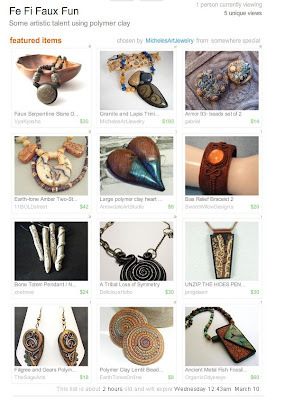 The Etsy Treasury is an ever-changing, member-curated shopping gallery of handpicked items. Members can feature their favorite items, items selected on a theme or just whatever they like. They are temporary showcases, and this one will only be around till Wednesday so check it out soon! Fe Fi Faux Fun was created by Miss Michele of MichelesArtJewelry to showcase some of the fine "faux" creations offered at Etsy. All these pieces were created using polymer clay to mock precious stone, bone, wood, metal, and/or dichroic glass. Some tremendous artist are pictured here and I feel humbled to have one of my pieces shown beside theirs.